Career is chosen by several criteria: talent, desire, opportunities. Some people choose it according to parents’ plans and others despite all challenges reach their goals independently. For Mikhail Savchuk sport is something more than just a healthy lifestyle; its philosophy, culture, integrity of body and mind. 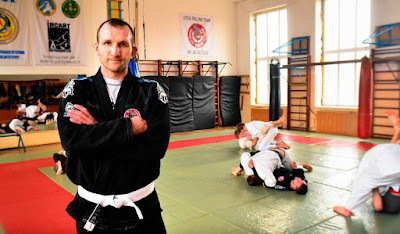 Mikhail Savchuk is a coach of Bushinkan Jiu-Jitsu, Brazilian Jiu-Jitsu and grappling in “GARDA” club. He is the official representative of Bushinkan Jiu-Jitsu in the Volyn region. Despite all his numerous titles and awards, Michael always stays a modest, simple person, whose main life aspiration is to make world better. “Most of all I want to take care of street children, explain them what a healthy lifestyle is, help them to overcome aggression they have. I want my pupils to become not only strong personalities, but also thoughtful personalities. I strongly believe that positive atmosphere in society depends only on self-improvements of each of us”. Mikhail admits that there are difficult days full of tiredness, irritations and bad mood. But, it’s better to stop in time and concentrate on pleasant things and leave the negative far away. At the age of 6, mother brought Mikhail to gymnastics and wrestling classes. Starting from this age, every day he has been improving his skills. He was engaged in classical wrestling, track and field athletics, football, boxing, judo, sambo, hand-to-hand fighting, and jiu-jitsu. By now he stopped on traditional Jiu-Jitsu, mixed martial arts and grappling. Speaking about sports, Mikhail says that he always liked fighting. So when he saw Brazilian Jiu-Jitsu fights for the first time, it has changed a lot inside him – so high and great the technical side of this sport was. “It’s all about self-development. And one more important aspect is that we are trying to unite and establish relations. After all the stronger the structure is the greater potential will be. And this, in turn, creates healthy competition and well teamwork result”, –noted Mikhail. Mikhail Savchuk believes that there is a great connection between sport training and internal self-developments. “I am a person, who has been doing sports for my entire life, and I try my best to convey the main message to my students – they will be able to become real personalities only having strong desire of harmonious development: physical, psychological and mental. Moreover, if every unit of our society goes under full development, we will be able to achieve more. In addition, we are also working on the growth of strong patriots in particular: 8ht of my students are in ATO as volunteers. Therefore, one of the tasks that I set for myself is formation of a physically strong patriots and personalities”, – proudly says coach. In conclusion, Mikhail highlights that sport isn’t just about physical strength, but a culture that educates a lot. “For me, sport is life. I believe that no matter what you do – you should always be humane and constantly work on self-improvement to become a better version of you. My motto is self-development and hard work always goes first, because the strongest metal is tempered with a hot fire, “- said Mikhail Savchuk.